Are Weather Patterns for our Area Really Changing? I will address what appears to be a long term and possibly violent change in our weather pattern. First here is a storm update. The first wave has pushed through and brought with it some cold air. The most snow fell in the Central Sierra where Mammoth picked up nearly 2 feet. 6-12 inches fell on Rose. We are going to get a decent amount of snowfall up here, but much of the moisture will fall south of here, where they really need it! These two storms have been a real blessing for the state. I call it free water for all, but the miracle of desalinating the trillions of trillions of gallons of water and dumping it on California is drought stricken areas is fantastic news and supports the law of averages, they were really due. 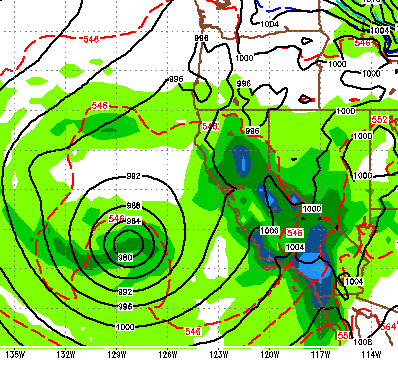 The storm that I am keeping an eye on has Tahoe in its cross hairs for next Thursday. This is a bigger storm and could bring 2-4 feet to this area. Of course that is along way off, but here is a look for next Thursday. 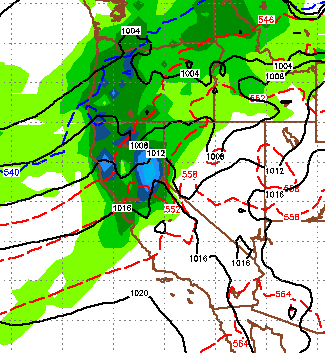 This is a storm born in the north that will pull moisture from the Pacific. Snow levels cold be higher for this one as this storm will tap into warm moist air. 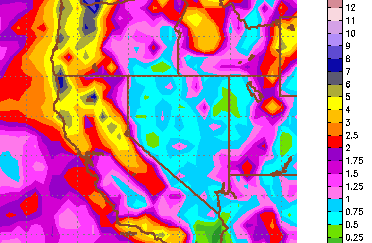 As you can see a large area of 4-6 inches is forecast for west and north of Lake Tahoe. Now, is this something that we can expect? Is a March miracle in the cards? Nobody has the answer to this question, at least no mortal man. Much like the doomsday forecasters that predicted 2014 was a bust in January (you know who you are), it would be impossible to predict what is to come. However, consider this; we have had more snow in the last 3 weeks than all of 2013. We are seeing warming of water surface temps off the equatorial Central American coast. That usually means more violent weather, especially for the state of California. NOAA is talking about a spring 2014 El Nino along with a summer 2014. If we are looking for an instigator for our weather change, perhaps we need to look no further. As I continue to read articles talking about the California drought and how it was brought on by you driving your SUV (BTW: The idiots that claim that drive around in Limos and Learjets), I can't help to wonder why we are not embracing this weather change? One thing is for sure, we are getting paid by nobody at the TWB. If it rains we are happy (until it floods) and we will continue to report the weather as is.